Sass is a dynamic stylesheet language. It allows considerable flexibility in the way you write CSS files including support for variables, mixins and more. Compilable assets in Play are typically defined in the app/assets directory. They are handled by the build process, and Sass sources are compiled into standard CSS files. The generated CSS files are distributed as standard resources into the same public/ folder as the unmanaged assets, meaning that there is no difference in the way you use them once compiled. For example, Sass source file app/assets/stylesheets/main.scss will be available as standard CSS resource, at public/stylesheets/main.css. Any Sass file (*.scss/*.sass) will automatically be compiled. The Sass plugin will automatically determine which Sass syntax is being used (indented or not) based on the filename. A file who’s name starts with an _ will not be compiled separately. However, such files can be included in other Sass files by using the standard Sass import feature. WebJars enable us to depend on client libraries without pulling all dependencies into our own code base manually. 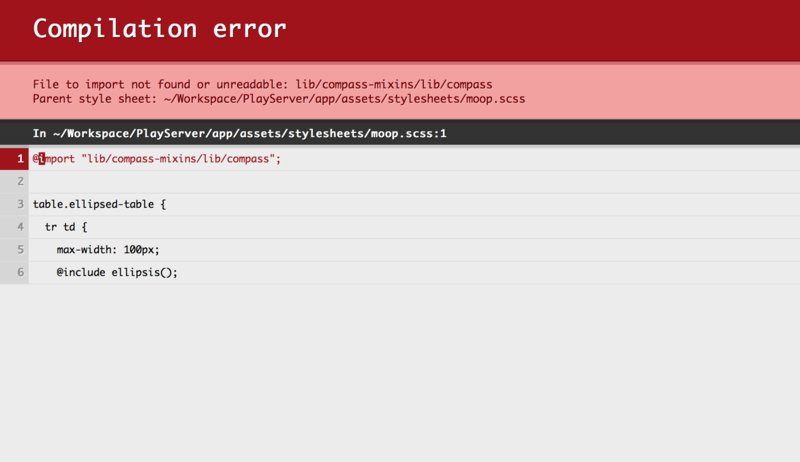 Compass is a library containing all sorts of reusable functions and mixins for Sass. Unfortunately, this library is targeted towards the Ruby implementation of Sass. There is a number of useful mixins that can be extracted from it. Fortunately, these mixins are wrapped in a web-jar. libraryDependencies += "org.webjars.bower" % "compass-mixins" % "0.12.7"
libraryDependencies += "org.webjars.bower" % "bootstrap-sass" % "3.3.6"
The plugin’s default configuration should normally be sufficient. However please refer to the plugin’s documentation for information on how it may be configured as well as its latest version.